← Baltimore Screening Pass-palooza: “Valerian and the City of a Thousand Planets”! Con News: LYNDA CARTER comes to Baltimore Comic-Con! One Night Only! Holy cow – Wonder Woman is coming to Baltimore Comic-Con! Okay, it’s really Lynda Carter, the woman who brought Wonder Woman to life on TV. But just as awesome, right? And did you know she’s an incredible singer too? Yes indeedy – and she’ll be at Baltimore Comic-Con on Friday, September 22nd, 2017 for a one-night-only one woman show! Seriously, if you’re interested, snap up tickets now. I’m sure this will be a huge event during BCC. BALTIMORE, MARYLAND – July 8, 2017 – The Baltimore Comic-Con returns to the Inner Harbor’s Baltimore Convention Center on September 22-24, 2017. The Baltimore Comic-Con is pleased announce a Friday evening event on September 22nd at 7:30pm, featuring a special performance by Lynda Carter as she brings her show, “The Other Side of Trouble”, to “America’s Greatest Comic Book Convention” for a very special 90 minute concert. This is a one-night-only event, so make sure to get your tickets early as it is guaranteed to sell out! This will be a memory that lasts a lifetime, with opportunities to see a wonderful concert performance and hear her stories. This is a unique event, brought to you by the Baltimore Comic-Con. Born in Arizona, Lynda Carter is best known for winning our hearts as TV’s iconic Wonder Woman. In addition to her long acting career, Lynda is also an accomplished singer who has performed to rave reviews before sold-out crowds around the world. Lynda has the distinction of producing and starring in five highly rated CBS television specials, several of which were Emmy Award nominated. She has appeared onstage with many of the world’s most popular singers, including Kenny Rogers, Ray Charles, Tom Jones, George Benson and Ben Vereen. Lynda made her professional singing debut at age 14 in Tempe, Arizona. 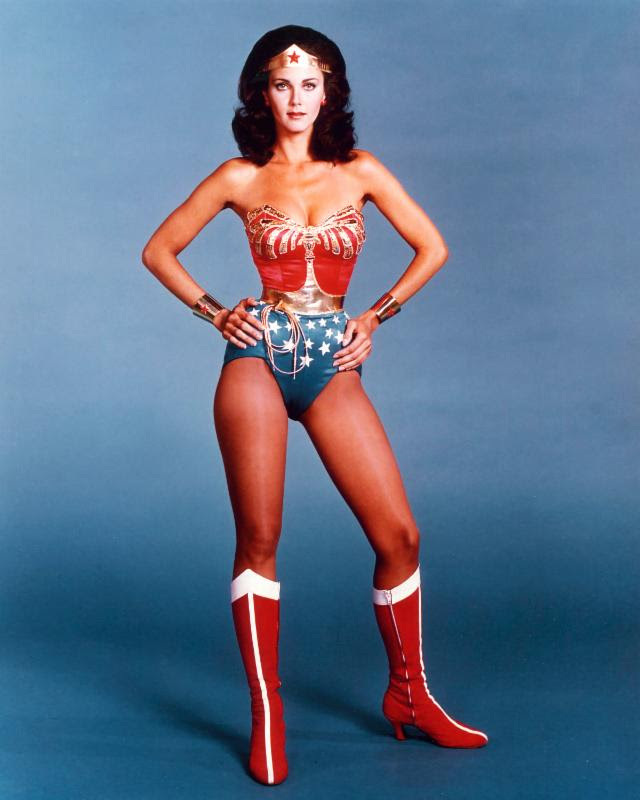 In 1972 she won the Miss World-USA title and shortly after outdistanced hundreds of other actresses for the part of Wonder Woman, a character she infused with such depth, humor, and empowerment that it has become one of the most indelible characters in television today. Her fame led to her becoming the “face” of Maybelline Cosmetics, and she remained their top model for over a decade. In addition to Wonder Woman, Lynda’s long and successful career has included starring roles in 2 other television series, Partners in Crime and Hawkeye, starring in numerous movies, and appearing in many television roles on such series as Law and Order and Two and a Half Men. This year, she has a role as the President of the United States on the popular CW series Supergirl, and she will be seen in the upcoming Super Troopers 2 movie. After taking a hiatus from acting to raise her young children, Lynda returned to live performing in 2006, starring in the hit musical Chicago in London’s West End. She also appeared in the show’s 10th year Broadway performance and is featured on the special Anniversary CD. So passionate was her love of singing and performing, she then put together an all-star band and tours the country every year with a new concert show in major venues from Washington D.C’s Kennedy Center to Jazz at Lincoln Center in New York. In 2009 and 2011, she released the chart-topping CD’s, At Last and Crazy Little Things, and is presently recording a new album in Nashville. Even though she has been writing and recording original songs since 1973, the past few years have brought Lynda a legion of new fans who recognize her from her many voice-over appearances in hit video games, including the Game of the Year Fallout 4 for which she also wrote and performed five songs, one of which received a Best Original Song nomination from the National Association of Video Game Reviewers. In addition to her professional endeavors, Lynda has been the recipient of numerous honors and awards, including one given her this past May when she was presented with the Lifetime Achievement Award by the Alliance for Women in Media (The Gracies) for her pioneering role for women in television. A long-time advocate for equal and human rights, Lynda has supported many charities, including as a founding member of the National Race for the Cure (for breast cancer research), and for such other organizations as Father Martin’s Ashley, the U.S.O., Red Cross, Ronald McDonald House, God’s Love We Deliver, GLAAD, and many other charitable organizations. Proud of her Hispanic roots (her mother, Juana Cordova Carter was of Mexican descent), she was presented the Raul Julia Award from the National Hispanic Arts Foundation in Washington, DC last year. In April of 2018, Lynda will be honored with a Star on the Hollywood Walk of Fame. To get all of the details about the event packages and limited ticket availability, please see our tickets webpage. In the coming weeks, look for more announcements from the Baltimore Comic-Con. We are looking forward to highlighting our guests, industry exclusives, and programming. The latest developments can always be found on our website, Twitter, Instagram, and Facebook pages. This entry was posted in Convention-al and tagged Baltimore Comic-Con, Con News, Lynda Carter. Bookmark the permalink.